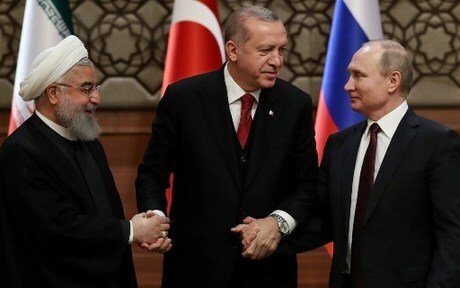 The presidents of Iran, Russia and Turkey meet Friday in Tehran for a summit expected to shape the future of Idlib province, home to Syria's last major rebel bastion. Damascus and its main backer Moscow have vowed to root out the jihadist groups that dominate Idlib province but the outcome of Friday's meeting could determine the scope and the timing of an offensive. "We know that the Syrian armed forces are getting ready to solve this problem," President Vladimir Putin's spokesman Dmitry Peskov said on Tuesday. Turkey has limited sway over the jihadist groups that control an estimated 60 percent of Idlib but it backs rebel groups there and has 12 military "observation points" across the province. In parallel to the Syrian government's military buildup, the recent weeks have seen intense diplomatic activity. Al-Watan, a Syrian daily close to the government, wrote on Monday that the result of the talks will be presented in Tehran for the three powers "to endorse it and decide on the 'zero hour' for the Syrian army's military operation, which is expected to immediately follow the summit." Russian Foreign Minister Sergei Lavrov said the armed groups in Idlib attacking Syrian government positions and Russia's air base in nearby Hmeimim should be eliminated. At stake in Tehran is the scope of the offensive and Lavrov said Tuesday that efforts were being made to separate "regular armed oppositionists from terrorists." The main target of an offensive would be the jihadist fighters from Hayat Tahrir al-Sham, a jihadist alliance dominated by the former Syrian branch of al-Qaida. "We are continuing contacts before the summit and preparing it to make sure it yields a good outcome," he said. The International Crisis Group insisted a devastating offensive in Idlib could and should still be averted, calling this week on all brokers to go back to negotiations. It said Russia needed to be convinced that backing an all-out Syria offensive risked undermining its own long-term objectives, which include the "re-legitimation" of Assad and his regime. The think tank said the three Astana guarantors should thrash out a plan that would satisfy some of Moscow's key demands. ICG cited "intensified Turkish efforts to rid the area of jihadists, an end to drone attacks on Russia's (Hmeimim) air base and regime control over Idlib's key highways."